dot linking: Who owns America's debt? The ever wonderful Guardian Datastore has published the latest US Treasury debt figures which are up to August 2010 and show where in the world American debt is held. 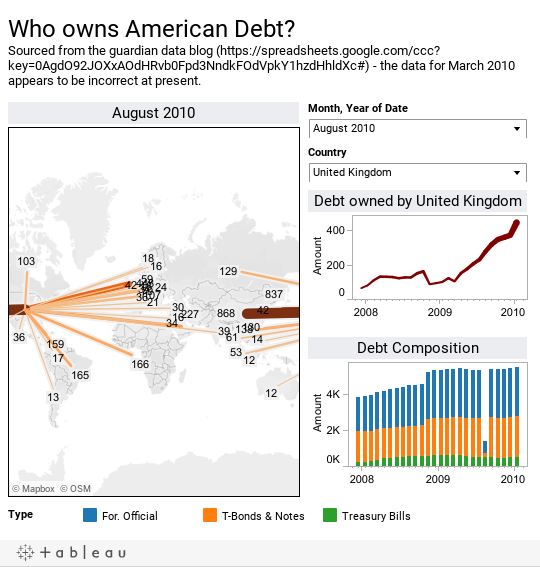 I've visualised the data using the brand spanking new Tableau Public 6 to show both where the debt is held geographically along with some time series charts to allow inspection of individual countries debt holdings over time. At the total level, debt holdings and the form of the debt are relatively unchanged month on month - the one notable exception to this is March 2010 which has clearly anomalous data in terms of the forms of debt (something that the Guardian datablog acknowledges, but apparently is also incorrect in the original published data). However, looking at country-by-country holdings, something strange seems to be happening to UK holdings of American debt, which have grown from around $100bn in 2008 up to $400bn in the latest figures (to put this in context China held about $500bn in early 2008 and that was a concern for some). Given the current state of public finances in the UK, it is unlikely that the UK government is holding this debt. "We put the UK in parentheses as the end purchaser in this case is anyone but an an austerity-strapped and deficit reducing UK. Whether this is the domain of the mysterious direct bidders, an offshore FRBNY holdco, or just Chinese buyers domiciled in the UK, continues to be unknown." Is Facebook the new kettle?